August 2007: "This is probably the first time that I give the EAE Award to a site whose idea predates the Internet by many years. Orion Press was founded as a fan fiction zine as soon as in 1979, before 90% of what we know of Star Trek today even existed. So it is no surprise that Randall Landers, who compiles the zine and runs the site as well, focuses his work exclusively on TOS. As a huge fan fiction portal, Orion Press offers a bibliography, an index, a timeline and a lexicon in addition to the actual stories. As a TOS site, it also hosts a large number of "historical" articles from the fanzines, commentaries, interviews, deleted scenes and much more pertaining to The Original Series. Visiting this site, in the best sense, is like a time travel to the pre-Internet era of fandom. It is remarkable how unswervingly Orion Press defies recent web trends of highly flexible databases and dynamic pages, and probably no one can understand that better than I do, because it would be an insane amount of work to convert everything. I sincerely hope the site will live long and prosper, even if it is not in the spirit of the next generation that we are faced with - the one of Web 2.0." 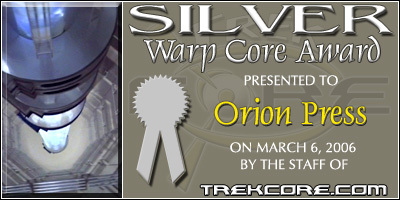 Your site has been awarded TrekCore.com's Silver Warp Core Award! You'll find the award itself attached to this e-mail. Please be sure to host the image on your site, as a testament to your efforts. Please also link the image back to TrekCore.com. We at TrekCore feel that everyone who makes a true effort to create a Star Trek website deserves recognition. Bravo!